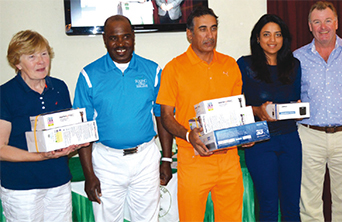 A dozen Awali Golf Club (AGC) players travelled to Abu Dhabi over the weekend to compete in a team matchplay competition against Al Ghazal Golf Club (AGGC) and hoping to retain The Hindmarsh Trophy. The inter-club match, this being the fourth to be played, has seen the host club always emerging victorious. As the first two results were returned after play, some concerned looks were seen on the faces of the host team’s players as both were in favour of the away team, AGC. However, as the results of the remaining tussles arrived, the tide slowly turned in AGGC’s favour resulting in a victory to Al Ghazal to recapture the Hindmarsh Trophy from Awali’s grasp with a score of 4½ to 3½, the closest result seen in the competition’s history. This instalment of ‘Awali Goes Forth’, organised by AGC’s Richard Pawson and AGGC’s Dave Tait, kicked off with an evening reception at the Al Ghazal clubhouse on Thursday allowing competitors to meet for the first time and for everyone to size up their opponents. Awali players were surprised by an announcement that the matchplay would take place the following day, not as AGC expected on the second day. 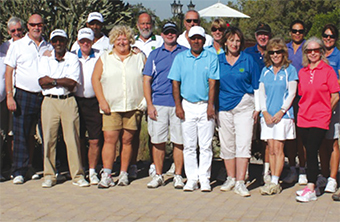 As six of the AGC players were visiting the Al Ghazal course for the first time, the hosts appeared to have an unfair advantage. With the two captains scurrying away for a tête-à-tête, AGC’s Captain Abdul Elah Fakhroo emerged to announce that the match would be played on the second day. On Friday, Awali players integrated into Al Ghazal’s normal weekend competition field so as to gain familiarisation with the course, one that is significantly different from AGC’s course as it has fairways of sand and water hazards with real water! As part of this competition, all players were invited to enter a side competition – ‘the twos club’ - where a prize is awarded to a player who achieves a gross score of two on a hole. In a showing to embarrass the home side and boost AGC’s morale, only two players achieved the elusive gross-2: AGC’s Onny Martin and securing the twos club prize, AGC’s Petri Kettunen. An AGC-only competition was also held, with the prize-winners carding some respectable scores. First place went to Kettunen with net 75, Nicky Bailey coming home as runner-up with net 79 and Martin third with net 80. Clear blue skies and a swanky line of buggies greeted the players for Saturday’s main event, shotgun start at 10am. In terms of AGC players, the accolades belonged to those not losing their matches: Beth Robinson (with AGGC’s Walter Tiamfook) 7 & 6, Tony Robinson (with AGGC’s Tago Ranginya) 3 & 2, Martin (with AGGC’s Eric Baboulin) 1-up, and Bailey (with AGGC’s Angela Tiamfook) halved.